I am taking a metalsmithing class at the Lawrence Art Center and it is a real eye opener for me! I should have done this years ago. We have a great teacher, Bryan Park, a great facility, and all the students seem really glad to be there. 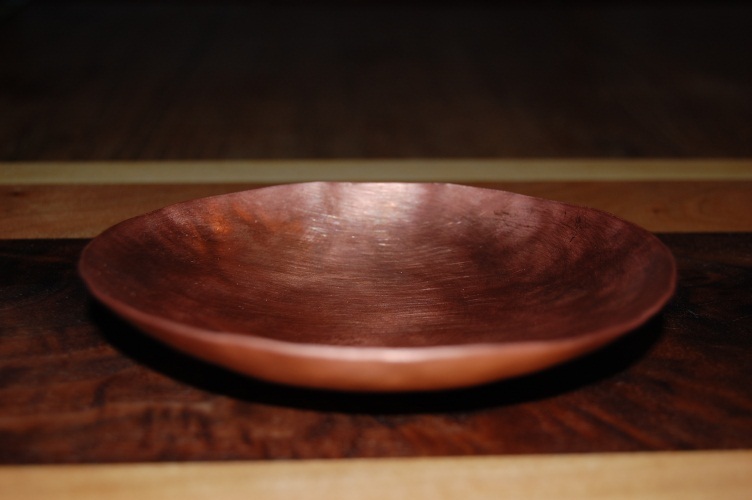 This week, I started raising my first vessel from a flat sheet of copper. Here it is after two preliminary rounds of sinking (beating the copper into a depression to start the right shape). This entry was posted on July 1, 2010 at 2:53 am and is filed under metalwork, Raising Copper. You can follow any responses to this entry through the RSS 2.0 feed. You can leave a response, or trackback from your own site. raising and planishing copper sheet, WOW!!!!!!!! your topics have reminded me of my apprentice days as a sheetmetal worker and coppersmith, sadly I furthered my career following HVAC and only worked in copper on very few occasions. Yeah, copper is really nice to work with. Thanks for looking at the site. Love the site , really like the copper section , are you currently posting new work? Hi – I have been posting most of my new work on Instagram lately – but I will pull some things over here this week. Thanks for the nice comments.